“FROM what we see, Islam [in Malaysia] appears like a one-way religion. But in the Quran, it’s not like this. Even if someone apostates, it’s not another human being’s right to persecute them,” Ainul Yakin Muhd Zin, 41, tells The Nut Graph. Perhaps this is why the sect that Ainul leads, the Jemaat Ahmadiyah Muslim of Malaysia, was branded a “threat to national security” in a 3 Aug 2009 Kosmo! report. In fact, Ainul says that in 1975, a fatwa by the Selangor Islamic authorities declared Ahmadiyah to be outside Islam’s fold. The fatwa also asked for Ahmadiyah followers to be killed by the sultan. Why indeed are Muslims and the Islamic authorities so afraid of Ahmadiyah? After all, according to Ainul, there are only around 2,000 Ahmadiyah in all of Malaysia. In the Klang Valley, there are maybe 600 Ahmadiyah followers only, and most of them are Malay Malaysians. 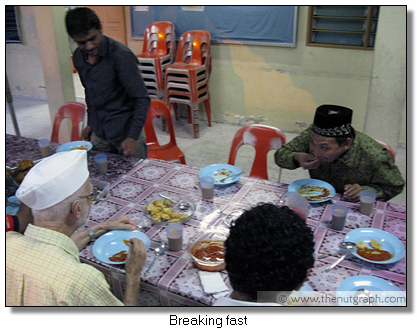 This, then, was what The Nut Graph aimed to find out on 4 Sept 2009 at the Ahmadiyah headquarters in Batu Caves, Selangor. Perhaps before answering the question of why there is so much hostility towards Ahmadiyah, we must look briefly at how Ahmadiyah differ from Sunni Muslims who make up the dominant group of Muslims in Malaysia. Ahmadiyah believe that Mirza Ghulam Ahmad, their founder from late 19th-century Qadian in present-day India was a prophet in his own right. However, they acknowledge Muhammad as the last of the law-giving prophets sent by Allah. Sunni Muslims, however, see this as an unforgivable deviation — there can be no prophets after Muhammad in Islam, full-stop. Ahmadiyah also have their own caliphate. 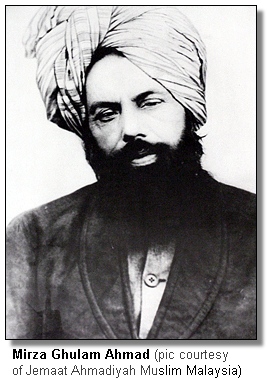 Their current caliph is the fifth succeeding Mirza Ghulam Ahmad, whom they count as their first caliph. In terms of doctrine, they also differ by arguing that the prophet Isa, or Jesus, died a mortal death and was not raised to heaven by God. Ahmadiyah also believe in Darwinist evolution to a certain extent — to them, Adam was not literally the first human being, but rather the first evolved human being. So in this sense, it is easy to see why Sunni Muslims have problems with Ahmadiyah doctrine. But the allegations against Ahmadiyah practices and beliefs do not stop here. “They say our prayers are mixed-gender. They say our kiblat (direction of prayer) does not point towards Mecca. This is all untrue,” explains Ainul. In fact, none other than Selangor religious exco Datuk Dr Hassan Ali claimed that Ahmadiyah “do not need to pray, do not fast during Ramadan and do not perform the haj”. Ainul, however, says, “First of all, there are Muslim governments that prevent us from performing the haj in Mecca when they find out we are Ahmadiyah.” During the asar (late afternoon) congregational prayer, The Nut Graph also observed the Ahmadiyah’s kiblat was no different from the conventional kiblat. When asked if any journalist from the traditional media came to verify this fact, Ainul said they hadn’t. “And do you see any women praying beside us? 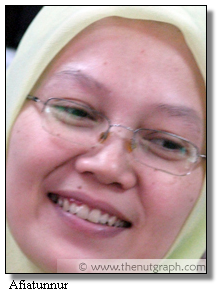 We observe purdah (gender segregation) very strictly,” says Ainul. That was indeed clear. In fact, The Nut Graph had to request repeatedly to interview some women Ahmadiyah because they were nowhere to be seen. But Ainul is good-natured enough to entertain this request. 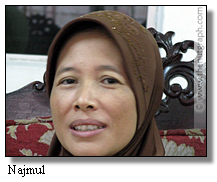 On 9 Sept, The Nut Graph met with two women Ahmadiyah leaders in Malaysia — Afiatunnur, 34, the Kuala Lumpur women’s chief, and Najmul Laila, 38, the moral outreach secretary. Najmul is also Ainul’s wife. Both women are Indonesians married to Ahmadiyah Malaysians. Afiatunnur and Najmul attest that things were once peaceful for them in Indonesia — Ahmadiyah even had protection from the state. But all this changed in 2005, when the Indonesian Ulama Council issued a fatwa calling for a government ban on Ahmadiyah. Violence then ensued. In July 2005, the Ahmadiyah headquarters in Bogor was attacked, causing it to be shut down. Attacks then spread all across Java, until today. In 2008, even former President Abdurrahman Wahid appealed for calm and for protection of Ahmadiyah, but his plea was ignored. In June 2008, Religious Affairs Minister Maftuh Basyuni, Home Minister Mardiyanto, and Attorney-General Hendarman Supanji signed a decree outlawing Ahmadiyah from spreading their faith. But Najmul and Afiatunnur are nothing if not forgiving of such persecution. “It’s all just because they misunderstand Ahmadiyah teachings,” says Najmul. But is this forbearance and humour from these two women too good to be true? When asked, for example, if women are obliged to cover their hair, both women agree fully. But are there Ahmadiyah women who do not cover their hair? This chill-out attitude pervades other aspects of Ahmadiyah life as well. Yes, they fast. And when they broke their fast, the meal was simple, and they did not dilly-dally before performing maghrib (dusk), and then isya (night) and terawih prayers in congregation. And yes, they have a 10-point pledge of allegiance, or baiat, that followers have to accept, calling for strict observance of morality, piety and worship. In fact, Ahmadiyah claim they have nearly 200 million followers worldwide. Their communities flourish especially in secular Canada and the UK, where they are recognised and visited by ministers and Members of Parliament. How do they deal with negative attitudes towards them, though? Ainul gives an example. 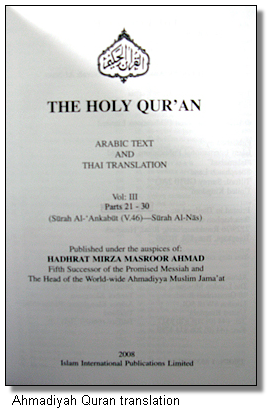 In December 2008, he says the Selayang Municipal Council (MPS) ordered them to remove the kalimah syahadat, or Islamic creed — “There is no God but God, and Muhammad is the messenger of God” — from their headquarters. “I said we cannot bring ourselves to do this, because this is truly what we believe. But if you believe we are wrong, then you need to be the ones to remove the kalimah yourselves,” he says. According to him, MPS then left the kalimah alone. There are, of course, even more sinister threats, and Ainul says that he has made several reports to the police and other authorities about these threats. He says, though, that until now no action has been taken based on these reports. “Why is this so? And if we are considered non-Muslims from the 1975 fatwa, why do the authorities continue to harass us? Why do they not leave us alone like the Buddhists, Hindus, Christians, and other non-Muslims in Malaysia?” asks Ainul.